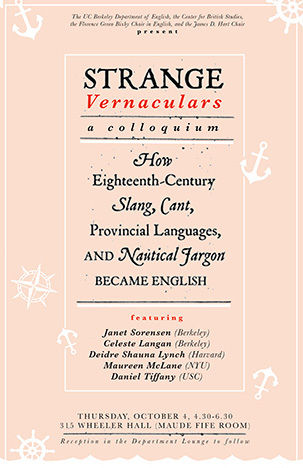 While eighteenth-century efforts to standardize the English language have long been studied—from Samuel Johnson’s Dictionary to grammar and elocution books of the period—less well-known are the era’s popular collections of odd slang, criminal argots, provincial dialects, and nautical jargon. Strange Vernaculars delves into how these published works presented the supposed lexicons of the “common people” and traces the ways these languages, once shunned and associated with outsiders, became objects of fascination in printed glossaries—from The New Canting Dictionary to Francis Grose’s Classical Dictionary of the Vulgar Tongue—and in novels, poems, and songs, including works by Daniel Defoe, John Gay, Samuel Richardson, Robert Burns, and others. Maureen McLane’s essay Compositionism: Plants, Poetics, Possibilities; or, Two Cheers for Fallacies, Especially Pathetic Ones! appears in our recent Fallacies special issue.